An empirical observation of real world economies is that the prices of a considerable number of goods respond slowly or incompletely to changes in demand. According to empirical studies in the Western economies, firms only rarely change their prices, perhaps on average once a year (Melmiès 2010: 450). The genesis of New Keynesian economics was in fact an attempt to establish empirical support for price stickiness, even though the New Classicals argued that the existence of price stickiness allegedly lacked microeconomic foundations in view of their rational expectations theory (Melmiès 2012: 452). (9) Link between quality and price. (Melmiès 2012: 453). More empirical work established that businesses themselves viewed the implicit contract, nominal contract, coordination failure, and cost-based pricing factors as the most important in affecting price rigidity (Melmiès 2012: 453; Blinder 1998). Most notably, the New Keynesian menu costs, nonprice competition, and costly information ideas did not receive much support (Melmiès 2010: 453). Furthermore, the New Keynesian idea is fundamentally one of constrained price stickiness: firms wish to change their prices, but are constrained by factors from doing so (Melmiès 2012: 454). By contrast, Post Keynesians would say that many firms quite deliberately set prices. Firms act to ensure their survival and grow their business and market share. By looking more at the long term state of demand, the price of many products is often not affected by short term changes in demand. The most important cause of price adjustments are changes in the costs of factor inputs and wages. Thus the pricing policies of firms are quite conscious and deliberate acts of price administration and setting, and this action results in a deliberately-caused price stickiness in the market. A consequence of this is that profit margins are also stable, and such margins are needed for internal financing of investment. It is important to distinguish between the New Keynesian view of price rigidity and that of Post Keynesianism. New Keynesians believe that, if only prices were perfectly flexible, then economies would adjust rapidly to full employment equilibrium. Post Keynesians, following Keynes himself, reject the view that perfectly flexible wages, prices and perfect competition would lead to full employment equilibrium. Even if there were perfectly flexible wages and prices, there could still be failures of aggregate demand (Davidson 1992). In Post Keynesianism, therefore, price rigidity is not the fundamental cause of demand affecting output (Melmiès 2012: 456). Blinder, A. S. et al. (eds.). 1998. Asking About Prices: A New Approach to Understanding Price Stickiness, Russell Sage Foundation, New York. Melmiès, J. 2010. “New-Keynesians Versus Post-Keynesians on the Theory of Prices,” Journal of Post Keynesian Economics 32.3: 445-466. Robert P. Murphy, “The Follies of the Modern Greenbacker Movement,” The American Conservative, June 27, 2012. The trouble with his article is that Murphy touts it on his blog as some kind of serious critique of MMT (“I ask for a comeuppance by the MMTers in this new piece at The American Conservative,” he says). In fact, the article only really gets to MMT in the last few paragraphs, and does not actually seriously engage with it. Murphy’s largely anonymous targets appear to be non academic writers and people who advocate “debt free fiat money” – not even academic proponents of MMT. (1) Ellen Brown of Webofdebt.com (indeed Murphy refers to her specifically in his post). (2) Stephen Zarlenga of the American Monetary Institute (AMI), and author of the The Lost Science of Money. (3) other supporters of both Ellen Brown and Stephen Zarlenga’s theories. I am not sure whether Michael Rowbotham and the now largely defunct Social Credit movement might be included in Murphy’s list of “Greenbackers,” but what should be perfectly clear is that his targets are not, as far as I am aware, self-identified supporters of MMT at all. Let us now see below how virtually the whole article is a waste of time and essentially mangles what MMTers believe. Whatever the “Greenbackers” like Ellen Brown believe is irrelevant to MMT, for such people are not even MMTers at all. In fact, in an MMT system, bonds would still be issued to the private sector, to control interest rates, though there might be some direct purchases by a central bank from the Treasury. Again, whatever “Greenbackers” think is not what MMTers think. Australia had a type of system not far from MMT in its “tap system” of funding deficit spending, and yet contrary to Murphy’s rhetoric the system wasn’t destroyed by evil “political officials” causing some hyperinflationary disaster with their profligate spending: Australia’s inflation rate from 1940 to 1981 was in line with other countries where bonds were always issued to the private sector. “In the limit, one could imagine the Greenbacker program not only abolishing government deficits but also all forms of taxation itself. Every year, the government could decide how much it wanted to spend, and then simply “print” that much new money. The IRS could be shut down, and no one would ever need to fill out a tax form again. Besides the savings in explicit tax payments, individuals and businesses would be spared the expense of hiring CPAs. Furthermore, removal of the tax burden would instill a massive dose of “supply-side” incentives for more work and output. Now I have to say I am not familiar enough with the works of Ellen Brown or Stephen Zarlenga to say whether they really think taxes should be completely abolished, but no MMTer, to my knowledge, has ever proposed abolishing taxation, since, as in Keynesianism, MMT sees taxation as a fundamental way to manage aggregate demand. Hence in an MMT system taxes would never be completely abolished. And, as I have said above, bonds would still be issued to the private sector to control interest rates. Murphy then proceeds from the imagined scenario above to a “debunking” of the “Greenbacker program” by invoking the horrors of hyperinflation and currency collapse. In other words, all Murphy’s objections do not apply to MMT, for MMT never in the first place proposed abolishing taxes or completely “monetizing deficits”*. Finally, MMT says that, even though deficits are not “financially” constrained, they face real constraints in the inflation rate, exchange rate, available resources, capacity utilization, the unemployment level, and external balance. In short, Murphy’s article does not need to taken seriously: he does not even engage with anything but a straw man version of MMT. * I know MMTers object to the phrase “monetising a deficit,” so I will place quotations marks around the phrase. “What, then, are the causes of periodic depressions? Must we always remain agnostic about the causes of booms and busts? Is it really true that business cycles are rooted deep within the free-market economy, and that therefore some form of government planning is needed if we wish to keep the economy within some kind of stable bounds? Do booms and then busts just simply happen, or does one phase of the cycle flow logically from the other? The currently fashionable attitude toward the business cycle stems, actually, from Karl Marx. Marx saw that, before the Industrial Revolution in approximately the late 18th century, there were no regularly recurring booms and depressions. There would be a sudden economic crisis whenever some king made war or confiscated the property of his subject; but there was no sign of the peculiarly modern phenomena of general and fairly regular swings in business fortunes, of expansions and contractions. Since these cycles also appeared on the scene at about the same time as modern industry, Marx concluded that business cycles were an inherent feature of the capitalist market economy. All the various current schools of economic thought, regardless of their other differences and the different causes that they attribute to the cycle, agree on this vital point: that these business cycles originate somewhere deep within the free-market economy. The market economy is to blame. Karl Marx believed that the periodic depressions would get worse and worse, until the masses would be moved to revolt and destroy the system, while the modern economists believe that the government can successfully stabilize depressions and the cycle. But all parties agree that the fault lies deep within the market economy and that if anything can save the day, it must be some form of massive government intervention.” (Rothbard 2009 : 12–14). “we can … see how nonsensical it is to formulate the question of the causation of cyclical fluctuations in terms of ‘guilt,’ and to single out, e.g., the banks as those ‘guilty’ of causing fluctuations in economic development. Nobody has ever asked them to pursue a policy other than that which, as we have seen, gives rise to cyclical fluctuations; and it is not within their power to do away with such fluctuations, seeing that the latter originate not from their policy but from the very nature of the modern organization of credit. So long as we make use of bank credit as a means of furthering economic development we shall have to put up with the resulting trade cycles. They are, in a sense, the price we pay for a speed of development exceeding that which people would voluntarily make possible through their savings, and which therefore has to be extorted from them.” (Hayek 2008: 102). According to the logic of the ABCT, since capitalism has an endogenous/elastic money supply, not only from fractional reserve banking, but also from things as simple as bills of exchange and promissory notes, it will be hit by perpetual cycles. “Hayek, like Keynes, hoped to prevent a slump from developing by preventing the credit cycle from starting. But his method was very different. It was to forbid the banks to create credit, something which could be best achieved by adherence to a full gold standard. He was quite pessimistic, though, about this being practical politics, so his conclusion, like Keynes’s, was that a credit-money capitalist system is violently unstable – only with this difference, that nothing could be done about it. One can understand why Hayek’s doctrines attracted a certain kind of socialist: they seemed to reach Marx’s conclusions by a different route. Because of the Austrian school’s close attention to the institutional and political setting of a credit-money economy, Hayek’s picture of the capitalist system in action was altogether more sombre than that of conventional Anglo-Saxon economics, with its story of easy adjustments to ‘shocks.’” (Skidelsky 1992: 457). The Rothbardians attempt to evade what was plainly stated by Hayek by blaming fractional reserve banking (FRB), and arguing that FRB is fraudulent and immoral. “My Posts on Fractional Reserve Banking (Updated),” December 19, 2011. The cult of Rothbard stands as one of the most ignorantly anti-capitalist ideologies imaginable, with its gross misunderstanding of, and hostility to, fractional reserve banking – a fundamental institution of capitalism. Hayek, F. A. 2008. Prices and Production and Other Works: F. A. Hayek on Money, the Business Cycle, and the Gold Standard. Ludwig von Mises Institute, Auburn, Ala.
Rothbard, M. 2009 . Economic Depressions: Their Cause and Cure. Ludwig von Mises Institute, Auburn, Ala.
A talk by Steve Keen given at the Fields Institute in Toronto Canada, entitled A Monetary Minsky Model. I post below the audio of a talk by Bill Mitchell given in Melbourne (May 1, 2012) at “Can the Eurozone survive its Crisis?” (at the Monash University European Union Centre). A great talk. Prychitko, D. 2010. “Competing Explanations of the Minsky Moment: The Financial Instability Hypothesis in Light of Austrian Theory,” The Review of Austrian Economics 23: 199–221. There is some merit in the article, and it is not entirely negative. I have actually enjoyed some of Prychitko’s work in the past (such as Prychitko 1993). (1) On p. 218, Prychitko misses the point that effective and careful regulation of the financial markets – the policy actions that stop reckless lending to speculators and that prevent serious asset bubbles before they happen – was already a fundamental Post Keynesian policy prescription long before the 1990s. Thus Wray’s interpretation of the origins of the 2000s financial crash is in no sense some sudden change in the Post Keynesian explanation of what happened or “post hoc ergo propter hoc reasoning” (Prychitko, p. 218). Prychitko accuses Wray of misinterpreting “the past decade as a return toward an unhampered market economy.” That is just a straw man: nobody says that the 1980s–2000s saw a creation of some Austrian fantasy world of anarcho-capitalism or Misesian classical liberalism. The point is that the economic system that existed from the 1940s to the late 1970s was modified and attacked by New Classical, monetarist and neoliberal ideologues after about 1980, and was made deeply dysfunctional. These two acts were major contributors to the Savings and Loan crisis. Commodity Futures Modernization Act (2000). The SEC’s Voluntary Regulation Regime for Investment Banks (2004). “The Trade Cycle cannot be appropriately described by means of one theoretical model. We need a number of models each showing what happens when certain potential causes become operative. The many models that have been constructed by economists in the past are therefore not necessarily incompatible with each other. Overinvestment and underconsumption theories, for instance, are not mutually exclusive. None of them of course is the true theory of the Trade Cycle; each is probably an unduly broad generalization of certain historical facts. Once we admit the dissimilarity of different historical fluctuations we can no longer look for an identical explanation. In dealing with industrial and financial fluctuations eclecticism is the proper attitude to take. There is little reason to believe that the causes of the crisis of 1929 were the same as those of the crisis of 1873.” (Lachmann 1978:100–101). Under the sensible viewpoint of Lachmann that the “many models that have been constructed by economists in the past are therefore not necessarily incompatible with each other,” it would seem that Austrians could accept Irving Fisher’s debt deflation theory of depressions or even Hyman Minsky’s development of that theory in the financial instability hypothesis. (3) Needless to say, Prychitko’s attempt to defend the ABCT (pp. 212–217) doesn’t convince me. The US economy already had enormous slack in the early 2000s and the ability to import goods, and there is no reason why credit infusions would cause an unsustainable and serious distortion of the capital structure. “During those years [sc. 2000s], credit-induced demands for new homes caused a doubling of their values—an historically unprecedented event. The housing industry, of course, is a latticework of timely production projects and draws a wide variety of specific (yet complementary) higher-ordered inputs into the housing market.” (p. 215). But the new housing component of the boom is greatly exaggerated: many of the mortgages in the 2000s were merely refinancing and home equity loans, and the money obtained from the debt not used for new housing construction at all, but to pay credit card debt down or purchase more consumer goods. Robert Blumen, “Fannie Mae Distorts Markets,” Mises Daily, June 17, 2002. In the 2000s the economic effect of the subprime loans (such as liar’s loans or NINJA loans), where people used their houses as ATMs, was an asset bubble in housing, from which exotic CDOs were created. The economic effects – essentially caused by consumer loans – are clearly very different from the alleged distortions of capital structure imagined in the ABCT. Even if we assume that alleged unsustainable capital structure distortions occurred, they would have been swamped by effects coming from consumer credit expansion to asset bubble speculation, the financial effects of banks loading up on CDOs, MBSs, and CDSs, and then the financial crisis and debt deflation. Lachmann, L. M. 1978. Capital and its Structure, S. Andrews and McMeel, Kansas City. (1) Edward Feser, “Rothbard Revisited,” August 23, 2009. Edward Feser replies to Gerard Casey’s defence of Murray Rothbard as a philosopher. (2) Lorenzo, “About Austrian Economics,” Critical Thinking Applied, April 24th, 2012. An interesting critique of Austrian economics. (3) Steven Horwitz, “Some Thoughts on Lorenzo on Austrian Economics,” Critical Thinking Applied, June 18th, 2012. Steven Horwitz responds to the original critique in link (2) above. Two videos below of an interview with Robert Skidelsky on the current Eurozone problems, by Social Europe Journal. A nice interview here with Steve Keen on debt deflation and what has happened (and might happen) in 2012. A follow up on my last post, where I showed that Mises accepted a tendency for market economies to move towards equilibrium (or Mises’s “final state of rest”). “Analysis of the activities of production in a monetary market economy is a highly complex matter. An explanation of these activities, in particular the determination of prices and therefore the return to factors, the allocation of factors, and the formation of capital, can be developed only if we use the mental construction of the evenly rotating economy. This construction is developed as follows: We realize that the real world of action is one of continual change. Individual value scales, technological ideas, and the quantities of means available are always changing. These changes continually impel the economy in various directions. Value scales change, and consumer demand shifts from one good to another. Technological ideas change, and factors are used in different ways. Both types of change have differing effects on prices. Time preferences change, with certain effects on interest and capital formation. The crucial point is this: before the effects of any one change are completely worked out, other changes intervene. What we must consider, however, by the use of reasoning, is what would happen if no changes intervened. In other words, what would occur if value scales, technological ideas, and the given resources remained constant? What would then happen to prices and production and their relations? Given values, technology, and resources, whatever their concrete form, remain constant. In that case, the economy tends toward a state of affairs in which it is evenly rotating, i.e., in which the same activities tend to be repeated in the same pattern over and over again. Rates of production of each good remain constant, all prices remain constant, total population remains constant, etc. Thus, if values, technology, and resources remain constant, we have two successive states of affairs: (a) the period of transition to an unchanging, evenly rotating economy, and (b) the unchanging round of the evenly rotating economy itself. This latter stage is the state of final equilibrium. It is to be distinguished from the market equilibrium prices that are set each day by the interaction of supply and demand. The final equilibrium state is one which the economy is always tending to approach. If our data—values, technology, and resources—remained constant, the economy would move toward the final equilibrium position and remain there. In actual life, however, the data are always changing, and therefore, before arriving at a final equilibrium point, the economy must shift direction, towards some other final equilibrium position. Hence, the final equilibrium position is always changing, and consequently no one such position is ever reached in practice. But even though it is never reached in practice, it has a very real importance. In the first place, it is like the mechanical rabbit being chased by the dog. It is never reached in practice and it is always changing, but it explains the direction in which the dog is moving.” (Rothbard 2009: 320–322). 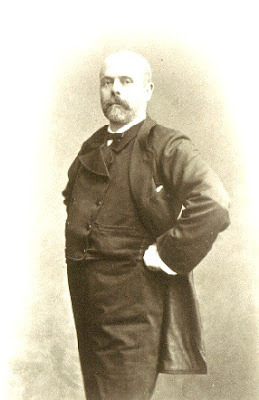 Léon Walras, whose photo appears below, was the founder of the neoclassical Walrasian economics tradition. A question that immediately occurs is this: did Walras think general equilibrium is ever attained in the real world? “Equilibrium in production, like equilibrium in exchange, is an ideal and not a real state. It never happens in the real world that the selling price of any given product is absolutely equal to the cost of the productive services that enter into that product, or that the effective demand and supply of services or products are absolutely equal. Yet equilibrium is the normal state, in the sense that it is the state towards which things spontaneously tend under a régime of free competition in exchange and in production.” (Walras 1954: 224–225). “Such is the continuous market, which is perpetually tending towards equilibrium without ever actually attaining it, because the market has no other way of approaching equilibrium except by groping, and, before the goal is reached, it has to renew its efforts and start over again, all the basic data of the problem, e.g. the initial quantities possessed, the utilities of goods and services, the technical coefficients, the excess of income over consumption, the working capital requirements, etc., having changed in the meantime. Viewed in this way, the market is like a lake agitated by the wind, where the water is incessantly seeking its level without ever reaching it. But whereas there are days when the surface of a lake is almost smooth, there never is a day when the effective demand for products and services equals their effective supply and when the selling price of products equals the cost of the productive services used in making them. The diversion of productive services from enterprises that are losing money to profitable enterprises takes place in various ways, the most important being through credit operations, but at best these ways are slow. It can happen and frequently does happen in the real world, that under some circumstances a selling price will remain for long periods of time above the cost of production and continue to rise in spite of increases in output, while under other circumstances, a fall in price, following upon this rise, will suddenly bring the selling price below cost of production and force entrepreneurs to reverse their production policies. For, just as a lake is, at times, stirred to its very depths by a storm, so also the market is sometimes thrown into violent confusion by crises, which are sudden and general disturbances of equilibrium. The more we know of the ideal conditions of equilibrium, the better we shall be able to control or prevent these crises.” (Walras 1954: 380–381). (3) The “equilibrating mechanisms” or “coordinating mechanisms” should not simply be identified with the actual tendency to general equilibrium in the real world. The latter is a distinct phenomenon, whose existence Post Keynesians would deny. The “equilibrating mechanisms” for Austrians and neoclassicals are regarded as things such as an equilibrium rate of interest clearing the loanable funds market, equilibrium prices, Say’s law, the tendency of the rate of profit to become uniform, entrepreneurship seeking profit, speculative arbitrage, significantly and quickly flexible wages and prices, and so on. It can be seen that some of these alleged “equilibrating mechanisms” do not even exist: the equilibrium rate of interest and Say’s law, for example. Others do not actually happen in the real world, such as rapidly adjusting wages and prices. Of course, even Post Keynesians would not deny that there do exist certain coordinating mechanisms. But the issue is whether the ones that do exist really work in the way imagined by neoclassicals and Austrians. The alleged combined effective operation of these “equilibrating mechanisms” is really a myth, and so is the strong tendency to general equilibrium. The fundamental insight of Keynes was that, even if we had perfectly flexible wages and prices, market economies would still not necessarily converge to full employment equilibrium. Significant unemployment could still exist even with perfectly flexible wages and prices. The insight of Irving Fisher and Hyman Minsky was that price deflation in an environment of high private debt causes debt deflation. No doubt there are more radical criticisms that could be made of capitalism, but it is important to make clear what Keynes thought. “our actual experience … [sc. is] that we oscillate, avoiding the gravest extremes of fluctuation in employment and in prices in both directions, round an intermediate position appreciably below full employment and appreciably above the minimum employment a decline below which would endanger life.” (Keynes 1936: 254). Keynes’s view was that real-world capitalist systems have a tendency to fluctuate around a state well below full employment: this is a major and serious problem of market economies. Keynes, J. M. 1936. The General Theory of Employment, Interest, and Money, Macmillan, London. Vienneau, Robert. “One Generation Passes and Another comes, but the World Forever Stays,” Thoughts on Economics Blog, August 12, 2007. Walras, Léon. 1954. Elements of Pure Economics, or, The Theory of Social Wealth (trans. W. Jaffé), Allen & Unwin, London. Jonathan Finegold Catalán, “Sloppy Interpretations,” Economic Thought, 9 June, 2012. I say no such thing. I do not deny that Mises was different from neoclassical economists on the position of equilibrium. I have always accepted that Mises never thought that the ERE or a state of general equilibrium is ever reached in the real world. (3) What I assert is that Mises believed in a “strong tendency towards general equilibrium as a real phenomenon of the market economy,” although the actual state is never reached. Belief in a tendency to equilibrium is completely compatible with the view that Mises believed that an actual equilibrium state is never reached. I take it that Catalán can understand the difference between (1) a tendency towards general equilibrium, and (2) actual equilibrium as a real world state. “Professor Hayek and Mises both espouse the market process, but do not ignore equilibrium as its final stage. The former, whose early work was clearly under the influence of the general equilibrium model, at one time appeared to regard a strong tendency towards general equilibrium as a real phenomenon of the market economy. Mises, calling the Austrians ‘logical’ and neoclassicals ‘mathematical’ economists, wrote: ‘Both the logical and the mathematical economists assert that human action ultimately aims at the establishment of such a state of equilibrium and would reach it if all further changes in data were to cease’ ... It is this view of the market process as at least potentially terminating in a state of long-run general equilibrium that now appears to require revision. In a kaleidic society the equilibrating forces, operating slowly, especially where much of the capital equipment is durable and specific, are always overtaken by unexpected change before they have done their work, and the results of their operation disrupted before they can bear fruit. Restless asset markets, redistributing wealth every day by engendering capital gains and losses, are just one instance, though in a market economy an important one, of the forces of change thwarting the equilibrating forces. Equilibrium of the economic system as a whole will thus never be reached. Marshallian markets for individual goods may for a time find their respective equilibria. The economic system never does. What emerges from our reflections is an image of the market as a particular kind of process, a continuous process without beginning or end, propelled by the interaction between the forces of equilibrium and the forces of change. General equilibrium theory only knows interaction between the former.” (Lachmann 1976: 60–61). “Potentially terminating in a state of long-run general equilibrium” is Lachmann’s way of referring to a tendency towards general equilibrium, not the state of equilibrium itself (or the ERE). Even Lachmann’s “equilibrating forces,” I would argue, should be distinguished from a fundamental and strong tendency of the real world market to general equilibrium, because the “equilibrating forces,” as Lachmann says, are thwarted by change, uncertainty and subjective expectations of economic agents which are liable to shift. If the “equilibrating forces” did in fact work consistently and in a reliable way, there would be a strong tendency to general equilibrium in market economies. But they do not. is understood, some kind of serous argument is possible. But straw man arguments refute nothing. Lachmann, Ludwig M. 1976. “From Mises to Shackle: An Essay on Austrian Economics and the Kaleidic Society,” Journal of Economic Literature 14.1: 54–62. This issue is relevant to debates in the comments section of Unlearningecon’s thought-provoking post “On The Similarities Between Austrian and Neoclassical Economics”. “Central to the current controversy in Austrian economics is the debate concerning whether or not the market harbors a tendency toward equilibrium. The skeptical position, represented by Lachmann, is that no such tendency exists. It is opposed in particular by Kirzner, who attempts to defend the more traditional, praxeological position.” (Selgin 1990: 37). “Commentators in the Austrian literature have emphasized and discussed the contrast between Hayek’s view that the tendency to equilibrium is an empirical matter and Mises’s view that it follows logically from the ‘activities of enterprising men.’” (Kirzner [ed.] 1982: 88). “Both the logical and the mathematical economists assert that human action ultimately aims at the establishment of such a state of equilibrium and would reach it if all further changes in data were to cease. But the logical economist knows much more than that. He shows how the activities of enterprising men, the promoters and speculators, eager to profit from discrepancies in the price structure, tend toward [p. 356] eradicating such discrepancies and thereby also toward blotting out the sources of entrepreneurial profit and loss. He shows how this process would finally result in the establishment of the evenly rotating economy. This is the task of economic theory. The mathematical description of various states of equilibrium is mere play. The problem is the analysis of the market process.” (Mises 1998: 352-353). So I am going to say that Mises did indeed adhere to the view that there is a strong tendency to equilibrium in the real world, even if that state never comes about. “Professor Hayek and Mises both espouse the market process, but do not ignore equilibrium as its final stage. The former, whose early work was clearly under the influence of the general equilibrium model, at one time appeared to regard a strong tendency towards general equilibrium as a real phenomenon of the market economy. Mises, calling the Austrians ‘logical’ and neoclassicals ‘mathematical’ economists, wrote: ‘Both the logical and the mathematical economists assert that human action ultimately aims at the establishment of such a state of equilibrium and would reach it if all further changes in data were to cease’ … It is this view of the market process as at least potentially terminating in a state of long-run general equilibrium that now appears to require revision.” (Lachmann 1976: 60). Of course, Paul Davidson, one of the leading Post Keynesians, was not especially impressed (Davidson 1989 and 1993). “Mutually advantageous interchange” does not seem to have progressed very far since then. Kirzner, Israel M. (ed.). 1982. Method, Process, and Austrian Economics: Essays in Honor of Ludwig von Mises, Lexington Books, Gower, Lexington, Mass. Mises, Ludwig von. 1998. Human Action: A Treatise on Economics. The Scholar’s Edition, Ludwig von Mises Institute, Auburn, Ala.
O’Driscoll, G. P. and M. J. Rizzo, 1996. The Economics of Time and Ignorance (2nd edn), Routledge, Oxford, UK. Selgin, George A. 1990. Praxeology and Understanding. Ludwig von Mises Institute, Auburn, Ala.
Murray Rothbard adopted a natural rights ethics to justify his system of anarcho-capitalism. I have already written a post here showing the logical foundations of his ethical system are incoherent and unconvincing. “The book, as it stands, seems to me to be one of the most frightful muddles I have ever read, with scarcely a sound proposition in it beginning with page 45 … It is an extraordinary example of how, starting with a mistake, a remorseless logician can end up in Bedlam.” (Keynes 1931: 394). With the requisite changes, one can say that same thing about Rothbard’s ethical theory. When judged by the standards of most other ethical theories (whose starting propositions and arguments are at least not so obviously false as natural rights), the logic of Rothbard’s theory takes him to conclusions that can only be described as moral insanity. “Suppose now that the baby has been born. Then what? First, we may say that the parents-or rather the mother, who is the only certain and visible parent-as the creators of the baby become its owners. A newborn baby cannot be an existent self-owner in any sense. Therefore, either the mother or some other party or parties may be the baby’s owner, but to assert that a third party can claim his ‘ownership’ over the baby would give that person the right to seize the baby by force from its natural or ‘homesteading’ owner, its mother. The mother, then, is the natural and rightful owner of the baby, and any attempt to seize the baby by force is an invasion of her property right. mother’s body possesses the right of self-ownership by virtue of being a separate entity and a potential adult. It must therefore be illegal and a violation of the child’s rights for a parent to aggress against his person by mutilating, torturing, murdering him, etc. On the other hand, the very concept of ‘rights’ is a ‘negative’ one, demarcating the areas of a person’s action that no man may properly interfere with. No man can therefore have a ‘right’ to compel someone to do a positive act, for in that case the compulsion violates the right of person or property of the individual being coerced. Thus, we may say that a man has a right to his property (i.e., a right not to have his property invaded), but we cannot say that anyone has a ‘right’ to a ‘living wage,’ for that would mean that someone would be coerced into providing him with such a wage, and that would violate the property rights of the people being coerced. As a corollary this means that, in the free society, no man may be saddled with the legal obligation to do anything for another, since that would invade the former’s rights; the only legal obligation one man has to another is to respect the other man’s rights. Applying our theory to parents and children, this means that a parent does not have the right to aggress against his children, but also that the parent should not have a legal obligation to feed, clothe, or educate his children, since such obligations would entail positive acts coerced upon the parent and depriving the parent of his rights. The parent therefore may not murder or mutilate his child, and the law properly outlaws a parent from doing so. But the parent should have the legal right not to feed the child, i.e., to allow it to die. The law, therefore, may not properly compel the parent to feed a child or to keep it alive. (Again, whether or not a parent has a moral rather than a legally enforceable obligation to keep his child alive is a completely separate question.) This rule allows us to solve such vexing questions as: should a parent have the right to allow a deformed baby to die (e.g. by not feeding it)? The answer is of course yes, following a fortiori from the larger right to allow any baby, whether deformed or not, to die. (Though, as we shall see below, in a libertarian society the existence of a free baby market will bring such ‘neglect’ down to a minimum. )” (Rothbard 1998: 99–101). (1) Rothbard contradicts himself by asserting that a newborn “cannot be an existent self-owner in any sense,” yet arguing in the very next paragraph that every newborn “is therefore no longer contained within his mother’s body possesses the right of self-ownership by virtue of being a separate entity and a potential adult.” Thus the parents’ “ownership is not absolute.” It beggars belief that Rothbard can accept that no child can be killed by active attack, but at the same time can be killed by passive neglect. Yet this argument blatantly contradicts Rothbard’s argument elsewhere that creation of fiduciary media (debt money such as fractional reserve banknotes) and use of this as money is not moral, because others suffer the effects of inflation and loss of purchasing power. Yet private transactions in which parties freely and voluntary create and use debt money must be regarded as moral by Rothbard’s own argument here: whatever effects free transactions using debt money have on others’ through inflation is not an argument for banning debt money, for “no man may be saddled with the legal obligation to do anything for another, since that would invade the former’s rights.” Thus Rothbard’s contention that only negative rights must be respected is not even a consistent position in his own work. It is quite apparent that the Rothbardian moral world is a grotesque, vile and cruel landscape, affording no protection to the most helpless human beings from irresponsible parents. This is a world where parents who are mentally ill, psychopathic or pathologically cruel can kill their children at will, albeit passively by withdrawal of care. It also raises other issues: if parents have a legal right to withhold food from a newborn child in Rothbard’s mad world, then what about a crippled adult child? If my 40 year old son is a quadriplegic, lives with me and is dependent on me, with no other person to support him, do I as a parent have the legal right to kill him by withholding food or care? Even when he is capable of clearly saying he does not wish to die? If not, why not? Logically, it appears Rothbard is equally committed to the legal right of parents to kill mentally or physically disabled adult children as well: and, at that point, Rothbard’s world would allow “private sector” groups of humans who, as in Nazi Germany, practise euthanasia of the disabled, even when the disabled vehemently object to being killed. As Keynes said of Hayek, one could also say that this is also a perfect example of how Rothbard, starting with flawed assumptions, himself ends up in utter Bedlam. “Libertarian Ethics in a Family Way,” February 24, 2012. Callahan, G. 2012. “Liberty versus Libertarianism,” Politics, Philosophy, and Economics (published online before print February 5, 2012): 1–20. Keynes, J. M. 1931. “The Pure Theory of Money. A Reply to Dr. Hayek,” Economica 34 (November): 387–397. I have assembled below a set of links to various posts on my blog for debunking the theories of Austrian economics. Please note that not all the posts actually debunk Austrian theories, as some are merely descriptive, and allow the reader to understand what the Austrians believe. Some examine the history of the school. A few posts are even constructive in that Post Keynesians and some Austrians can agree on certain points (such as the posts on Ludwig Lachmann).